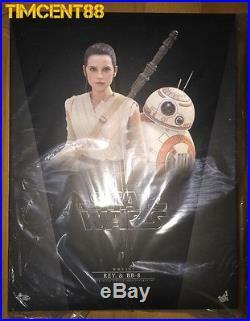 Star Wars: The Force Awakens - Rey and BB-8 1/6 Collectible Set. 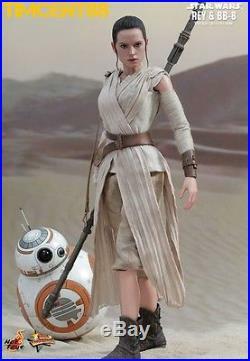 The highly-accurate Rey collectible figure is specially crafted based on the image of Daisy Ridley in the film featuring a newly developed head sculpt with fine hair sculpture, three interchangeable looks, meticulously tailored outfit, highly detailed accessories, a lightsaber, and a hexagonal figure stand with the Resistances emblem. The highly accurate BB-8 collectible is specially crafted on the image of the unique designed droid in Star Wars: The Force Awakens. 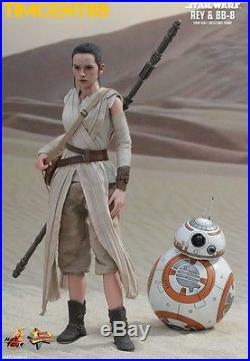 It features a newly developed spherical body embedded with self-balancing mechanisms, LED light up eyes, and a specially designed Jakku desert-themed figure base attachable to Reys hexagonal figure stand. 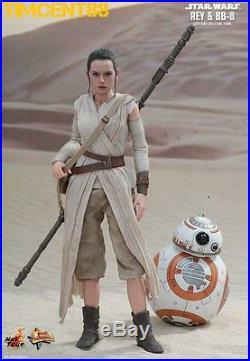 The 1/6th scale Rey Collectible Figure specially features: - Authentic and detailed likeness of Daisy Ridley as Rey in Star Wars: The Force Awakens - Newly developed head sculpt with highly-accurate facial expression and make-up - Body with over 28 points of articulations - Approximately 28 cm tall - Six (6) pieces of interchangeable palms including: - One (1) left fist - One (1) relaxed right palm - One (1) pair of palms for holding staff - One (1) pair of palms for holding blaster - Six (6) pieces of interchangeable gloved palms including: - One (1) left fist - One (1) relaxed right palm - One (1) pair of palms for holding staff - One (1) pair of palms for holding blaster - Each piece of head sculpt is specially hand-painted Costume : - one (1) head wrap with goggles can be worn on head sculpt to achieve 2 alternative looks - One (1) beige colored top - One (1) beige colored wrap dress - One (1) pair of beige colored arm wraps - One (1) detachable left shoulder pad - One (1) leather-like left wrist cuff - One (1) brown colored belt with pouch - One (1) pair of beige colored pants - One (1) pair of dark grey colored boots Weapons: - One (1) staff with strap - One (1) Lightsaber with blue colored blade (does not contain LED light-up function) - One (1) blaster pistol Accessories: - One (1) leather-like backpack with accessories - Resistance emblem hexagonal figure stand with Rey nameplate and Star Wars logo The 1/6th scale BB-8 Collectible specially features: - Authentic and detailed likeness of BB-8 in Star Wars: The Force Awakens - Newly developed spherical body embedded with self-balancing mechanisms - Metallic white, silver and orange painting - LED light up eyes (white light, red and blue lens, battery operated) - Approximately 11cm tall Accessory: - Specially designed Jakku desert-themed figure base attachable to Reys hexagonal figure stand. Hong Kong Post EMS SpeedPost. Buyers need to return the items to us in original packing. 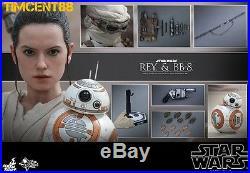 Hot Toys MMS337 Star Wars EP VII The Force Awakens 1/6 Rey and BB-8 set" is in sale since Tuesday, July 19, 2016. This item is in the category "Toys & Hobbies\Action Figures\TV, Movie & Video Games". The seller is "timcent88" and is located in HK. This item can be shipped worldwide.